Success does not come easy and it is a well known fact that there are no shortcuts to success. Every feat, be it small or big, require some effort to be put in it. It does take awhile to achieve success but when it does, there is nothing more rewarding than success itself! Most people give up halfway through their goals, owing to various reasons, while others don't even take the initiative. Its only those people who have a passion and a serious inclination towards their goals hang on till the end, to revel in their success. Successful people always have a dream, a plan of action, the ability to do the task, willingness to do it and they don't back down at any cost. Unsuccessful people on the other hand, find several reasons and means to justify their failures, wait for others to guide them and blame others for their mistakes. The attitude is what that shows whether the person is success oriented or not. 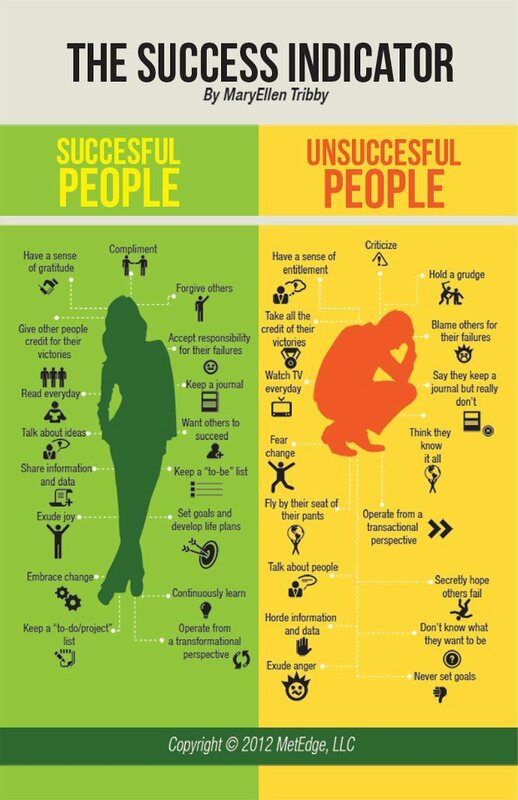 This infographic presents the traits and behaviors of successful people and unsuccessful people.